For many Americans the words revolution and liberty conjure up images of Paul Revere galloping on a horse or of the men who grace our currency, but in Seneca Falls, New York, visitors to Women’s Rights National Historical Park meet some unexpected revolutionaries who changed the face of American history. 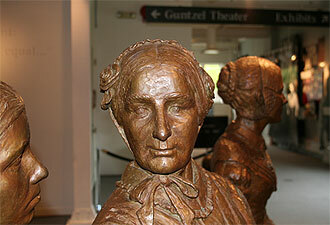 In 1848 five women organized a public meeting to protest the unfair laws and customs that discriminated against women. No other single event in American history caused so much change for so many people. The First Woman’s Rights Convention, held downtown in the Wesleyan Chapel, launched a crusade for equality that continues to inspire people around the world. Located alongside a branch of the historic Erie Canal, the scenic village of Seneca Falls might appear to be an unlikely place from which to stage a rebellion, but don’t let its serene appearance fool you! In the mid-19th century, it was on the vanguard of change. With its canal, railroad, and turnpike, Seneca Falls was a hub connecting urban centers from Chicago to New York City. Strolling along Fall Street, one can imagine the hustle and bustle of buggy and canal traffic accompanied by the hum of factories. Immigrants who flocked to the area seeking economic opportunity found themselves caught up in religious revival and antislavery meetings. Join a ranger in the Wesleyan Chapel to learn about the First Woman’s Rights Convention, its connection to the reform movements that swept through central New York, and the people who changed a nation. 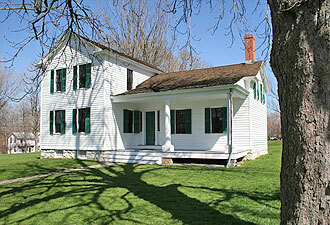 Less than a mile from the chapel is the home of Elizabeth Cady Stanton, one of the organizers of the 1848 convention. Stanton and her husband raised seven children here while she dedicated her creative spirit to the rebellion. Ranger-guided tours of her house reveal a brilliant woman who used the power of her pen and radical ideas about women’s equality to effect change in 19th-century America. Just as Thomas Jefferson drafted the Declaration of Independence to guide the spirit of the American Revolution, Stanton and the other organizers of the 1848 convention drafted the Declaration of Sentiments to guide and inspire their proceedings. This document was read and invoked at the many women’s rights conventions that followed. It became the blueprint outlining the goals of the women’s rights movement in the 19th and 20th centuries. Americans today have difficulty imagining a time when women were not allowed to vote or own property, yet these were just two of the rights denied to women in 1848 which were demanded in the Declaration of Sentiments. 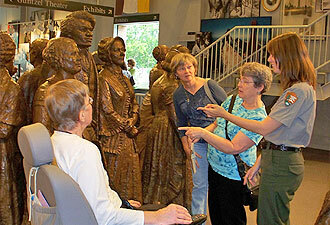 Following in the footsteps of the nation’s founders, Stanton and the other organizers of the First Woman’s Rights Convention began their document with a clear statement: “All men and women are created equal.” Women’s Rights National Historical Park invites you to commemorate the legacy of these heroic figures with us.